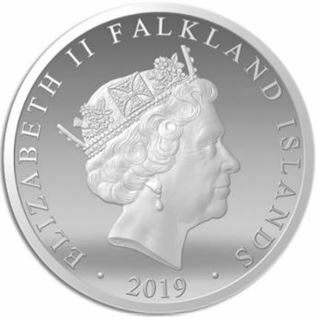 The Falkland Islands is going to issue a new series of circulating coins. On the obverse the pieces will depict a portrait of Her Majesty Queen Elizabeth II by Raphael Maklouf. The coin will be produced at the Tower Mint. This news may not be copied. 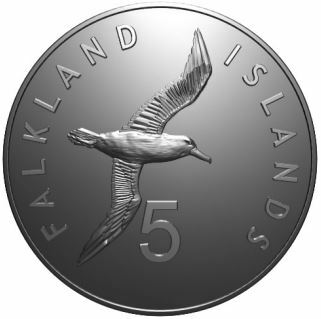 Before deciding the issuance of a new circulating coin series, the Government of the Falkland Islands considered to abandon the local currency and to still only use the Pound Sterling. They decided not to do so as "The existence of a circulating currency for a country is an indication of sovereignty, identity and economic activity". 3 UK based mints submitted bids for certain denominations of circulating coins. Currently it is only known that the 5p coins will be produced at the Tower Mint. The Government is currently considering the introduction of a new 12-sided 1 pound coin. Above we see the existing 5 pence. The new design would look more interesting with a different bird or animal. On the new design, the "5" is close to the bird's wing and so should have been moved further down to give the design a less cramped look. So they have dumped the Royal Mint for circulating coins then. 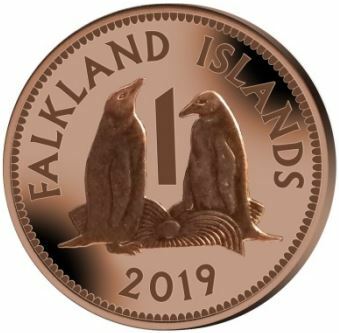 Having “Falkland Islands” on both sides of the coin does seem a bit odd. That’s the final reverse design then? As <k> says, there’s really no need for the “5” to be so close to the bird. I think I would have preferred the “Falkland Islands” removed from the reverse, “Pence” perhaps adding, and the “5” moved. Of the UK and “the six”, the Falklands has had the oldest reverse designs in use, and they even beat the UK’s maximum 41 years for the same designs (though of course the UK’s were amended in 1982, whereas apart from the date, the Falklands’ were identical). It will leave Jersey’s 1983 designs as the oldest in use on a sterling-based coinage, followed by some of St Helena-Ascension’s 1984 series and Guernsey’s 1985. The other three plus the UK will all have designs introduced in the 21st century. 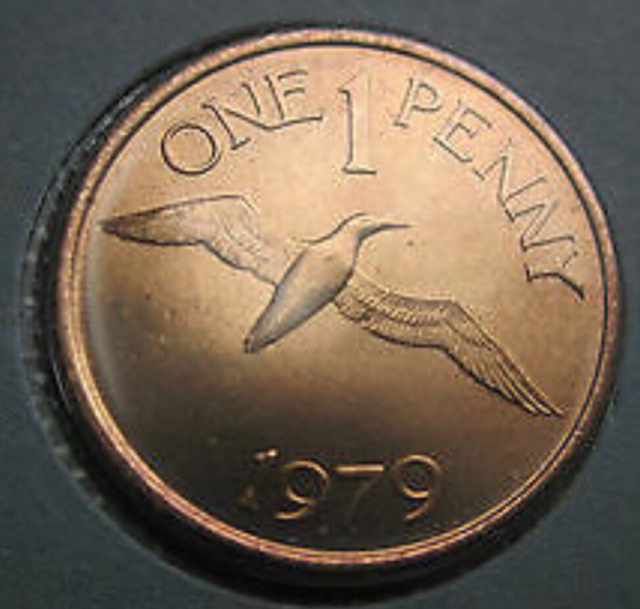 What about the UK "NEW" penny and 2 pence, still in use and dating back to 1971? I meant designs still being issued. Gibraltar and Isle Of Man change too often to neatly include in this. Other denominations may still be produced at other mints. The Royal Mint is no longer the only mint that produces circulating coins for them though. I have also heard that there may be changes to who produces their commemorative coins and collectors coins too. 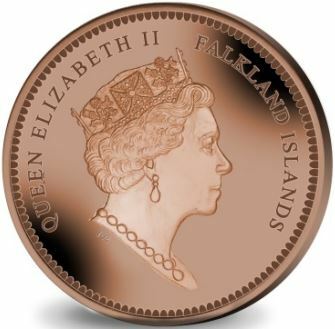 Having “Falkland Islands” on both sides of the coin does seem a bit odd. That’s the final reverse design then? As <k> says, there’s really no need for the “5” to be so close to the bird. I think I would have preferred the “Falkland Islands” removed from the reverse, “Pence” perhaps adding, and the “5” moved. Evidently a quote of the Falkland Islands' authorities….. But would they not consider that this is perhaps less obvious when there is only limited consistency in the obverse design in a series of coins ? Or would you consider that variation in obverses across the 2019 series would be minimal ? Maybe possible other mints involved in the production of the coins will also use the Raphael Maklouf portrait. If there are other mints involved in the minting of the new series and they use other portraits on the denominations they produce, I do consider that to be problematic. It is a black-browed albatross. The 1 Pence coin of the new series will continue to depict the design featuring 2 Gentoo Penguins and their nest by William Gardner. It will be minted at the Pobjoy Mint. Here is the original. I see they have removed Mr Gardner's initials. One or two other slight things are different: the fonts and their size, and maybe the bottom of the shape of the figure "1". On this design, the year appears on the obverse. And there is a different portrait of the Queen. Yes, the designers initials are indeed gone which I consider to be a shame. Indeed other then that very little change. Furtmermore we now have 1 series with 2 different obverse portraits, the 1p depicting the Pobjoy Mint portrait and the 5p having the Tower Mint portrait. I don't quite like that.